The Istanbul New Airport will offer the latest technology services. Turkish President Erdogan is set to inaugurate Istanbul's new airport, the largest in the world, at a huge ceremony, today, October 29, 2018, with the participation of several international leaders, transport ministers from several countries, as well as foreign ministers who will accompany heads of state and government. Located in the European part of the historic city of Istanbul, the New Airport will accommodate 200 million passengers annually, 114 aircrafts at the same time and operate three thousand flights a day. With 4 terminal buildings and rail access between terminals, 6 runways, 16 taxiways, and a 1,5 million square meters indoor area, upon completion before 2030. A new metro line will link the center of Istanbul and the new airport in no more than 25 minutes. The airport is built on an area of 76.5 million meters square. About $10.2 billion had been invested in the project, which is expected to generate about $ 22 billion in 25 years before VAT. Today’s grand opening comes after the completion of the first phase. the airport will start running 5 daily local flights, operated by Turkish Airlines, between Ankara, Antalya, Baku, Ercan, and İzmir. The airport for now has two runways and a terminal with 90 million passenger capacity, 8 parallel taxiways, and an indoor car-park with 12,000 vehicles capacity. The airport will boast many new technological features in aviation and airports in terms of size, infrastructure, safety and security systems, and the multi international award winning architectural aspects that combine heritage and modernity. “Istanbul New Airport, will serve as a technology base and be one of the smartest airports in the world, will also become a major incubation center for the aviation industry,” said Chief Executive Officer and General Manager of İGA Airport Operation, Kadri Samsunlu. The new airport is one of the mega projects happening in Turkey, including a third suspension bridge over the Bosphorus in 2016, and the opening of a huge canal in Istanbul that will turn a large part of the city into an island. 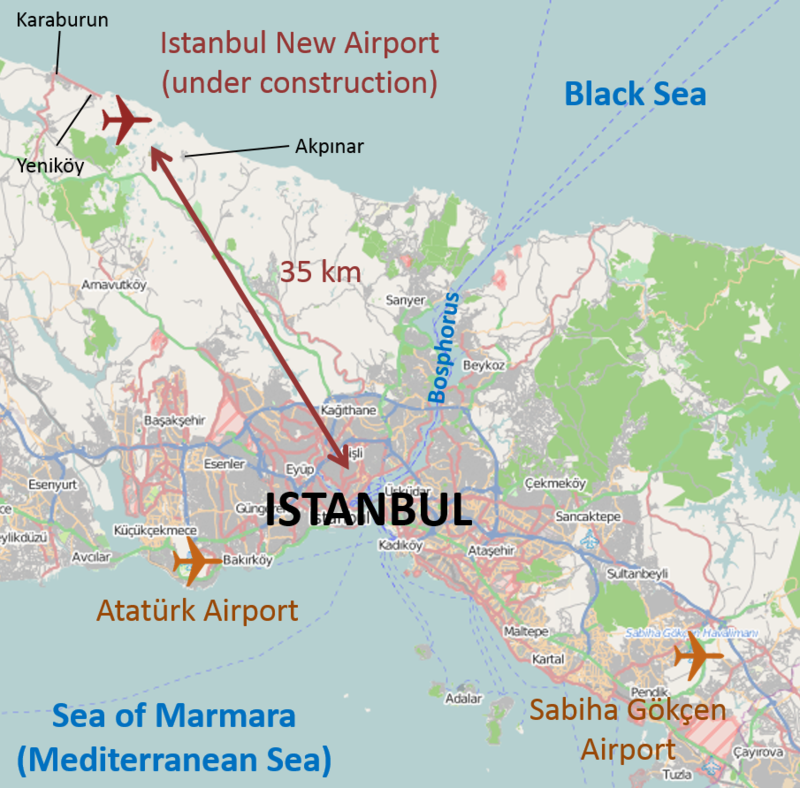 Istanbul's new airport is expected to replace the Ataturk International Airport, which will be shut down. The Turkish president has promised to turn Ataturk airport into a large park on par with Hyde Park in London, and Central Park in New York.